Just one Corncrake was reported during this Atlas, a bird heard calling on Cuerdley Marsh, Fiddlers Ferry (SJ58M) on 18 June 2005 only. The last known nesting in Cheshire and Wirral in the early 1970s was followed by an extraordinary record of breeding near Tatton in 1987, when two adults and a juvenile were found dead in late June, all apparently killed by traffic (Broome 1987). There were eight records in the years 1988 to 2004, all of them on one day only apart from a late September bird present for two days. As with the bird in 2005, they were presumably all on passage between their winter quarters south of the Sahara and breeding grounds in the northern isles. Almost all of the present British population of around 1,000 singing males is on islands in the Inner and Outer Hebrides and Orkney. Since 2003, Corncrakes have also been reintroduced to the Nene Washes in Cambridgeshire in a programme operated by the RSPB, Natural England and the Zoological Society of London (Holling et al 2007). 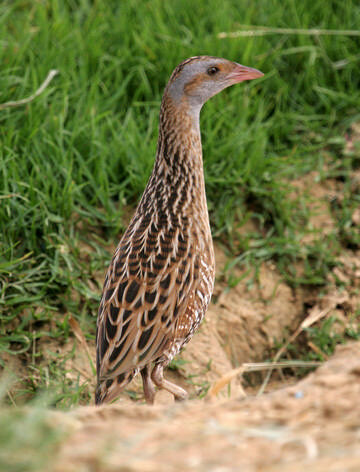 Corncrakes breed in tall grass and herbs, particularly hay and silage meadows, and modern agricultural practice, with early cutting of grass, is inimical to them. After a catastrophic decline and the species seemingly headed for extinction in the UK, the population has more than doubled since the start of Corncrake conservation schemes in 1993 (O’Brien et al 2006).